Dimensions (HxWxD): 25"x 13.75"x 18.5"
The Swingline stack and shred 300X auto feed shredder is a super cross cut shredder with a security level of 3 (P-4). It is capable of shredding 300 sheets of paper automatically. 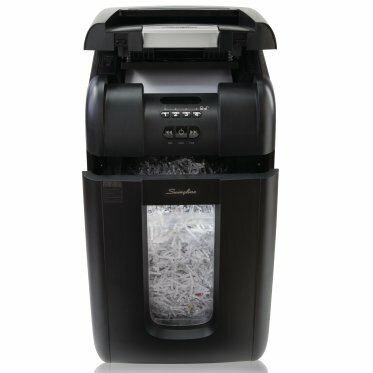 The user has to stack up to 300 letter size sheets into the top of the shredder and shut the lid for the shredder to automatically shred the whole stack in just 10 minutes. However, you can also shred at least 8 sheets of paper manually with this Swingline stack and shred 300x shredder. This Swingline stack and shred auto feed shredder will serve best in shared office spaces and departments and is built for use by 5-10 users. The 300X auto feed shredder also has an integrated lockable chamber with a programmable 4-digit PIN code. The user can keep unauthorized individuals from accessing the documents during auto shredding by locking it with the PIN code. Moreover, it also has two separate feeding slots and waste bin for shredding optical media and documents. The shredded paper falls into an 11-gallon waste bin. The Swingline 300X auto feed shredder also has a bin indictor that alerts the user when the bin needs to be emptied. 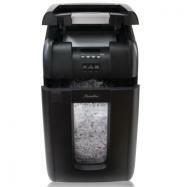 In addition, you can also shred credit cards manually with this Swingline stack and shred 300X auto feed shredder. The 300X auto feed shredder also includes Intelligent Auto+ Jam Clearance in order to prevent paper jams and deliver uninterrupted shredding operations. Additional features also include super quiet shredding operations and auto shut off power save function and intelligent self-cleaning cutters. The Swingline stack and shred 300X auto feed shredder comes with a 2-year warranty on machine and 20 years on cutters. Stack and shred 300 sheets of paper automatically. Can shred up to 8 sheets at a time manually. Capable of shredding paper, paper clips, staples. Credit cards are manually inserted in to the auto feed chamber. Lockable paper chamber with a 4-digit programmable PIN code lock for protecting documents during shredding. DVD’s and CD’s shredded through a separate slot in the auto feed tray. 2 year warranty on machine, 20 years on cutters.